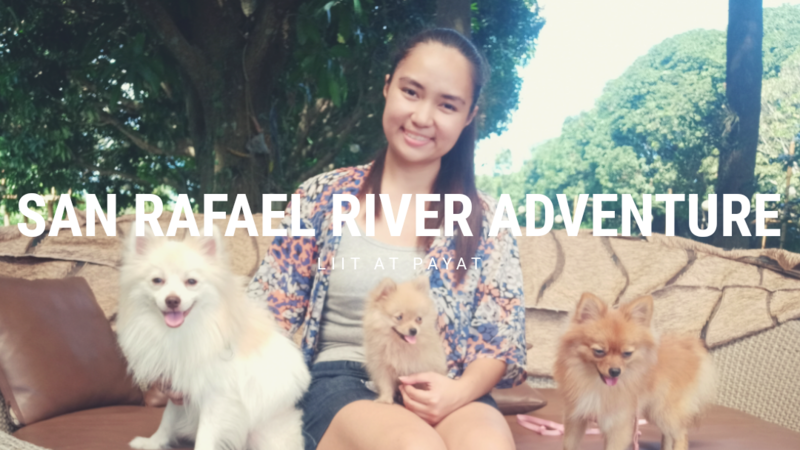 Fur parents rejoice as we found a pet friendly resort in Bulacan! San Rafael River Adventure (SRRA) should be on your bucket list. With its proximity to Metro Manila, SRRA is perfect for summer adventure. Bonus: There are lots of Instagram worthy spots around the resort like the Reflection Island. We tried SRRA’s Glamping day tour experience. For only P2,000.00 (2 pax), we stayed in their Gamping Tent with mattress, lamp, and electric fan. Their glamping tent can accommodate up to four guests because of its size. What we also liked with their glamping is they provide a vault inside the tent so the guests are comfortable to roam around the resort. For big families or groups, they have Glass Villa (maximum of 16 pax) or Glass Cabin (maximum of 14 pax) that ranges from Php 12,000 – Php 25,000. SRRA offers various packages for couples, family, barkada, and even big groups. Guests can choose from the Kubo, Glamping and Villa. Honestly, their packages are a bit pricey but it’s already inclusive of the entrance fee, access to Infinity Pool and 1-hour kayak. One good thing with SRRA is they don’t charge a corkage fee. Guests can bring food and drinks inside the resort. They can also lend griller upon request and availability. However, if you wanted to just enjoy, they offer a river cruise with lunch as well as their in-house restaurant. All guests are required to book prior to your trip. They recommend at least 1-2 weeks before your desired date because they usually get fully booked especially on weekends. Don’t worry when they say fully booked it’s just around 80 guests for the entire resort and you won’t even feel that they’re fully booked because they have wide space and lots of amenities for every guests. Ride a bus going to Baliuag. Baliuag Transit terminals are located in Cubao and Gracepark (2nd avenue). Once you reached Baliuag town proper (Bayan), ride a tricycle (TCP Toda) or jeepney (via Pulo) and tell the driver to driver to drop you off at San Rafael Riger Adventure. (The tricycle and jeepney terminal are located across San Agustin Church, in Petron gas station)Advice: Tricycle fare in Baliuag is expensive. Make sure to allocate an extra budget. Fare might start from Php 200 (one way). We cannot provide exact fare as we hired a trcycle service because we brought our pets. I’ve been seeing a lot of posts, beautiful photos, and great reviews of San Rafael River Adventure lately. I really want to go pay a visit. 😕 Was there a lot people during your stay? They were actually fully booked when we went there (Saturday). 80pax. But we were surprised that despite they told us “fully booked”, the venue is not crowded at all ans you can still enjoy all the amenities freely. Wow an affordable way to enjoy Summer. I was surprised that this is just at Bulacan. Will.keep this on my bucket list. Cool! Good thing that the place considers fur parents with their fur babies. I don’t own a pet now but I did in the past and having them during vacations and staycation is definitely a good thing! Good thing the resort is pet-friendly and would allow furbabies. I also appreciate that they do have a vault for the safety of their guests. Looking forward that I can see this promising resort soon! The place is so nice. Now ko lang narinig to pero I am interested to go there. Thank you for sharing. This resort looks awesome and glad it is pet-friendly. Still hard to find resorts that accepts pets as guests. I love the glamping concept. If I get to visit Bulacan, which we pass when we go home to Cabanatuan, I would love to try this glamping. I can’t remember the last time I visited Bulacan. When I was young, we used to visit Biak na Bato whenever we visit my great grandmother. I think it’s about time to explore Bulacan again! Thanks for the detailed review! I never tried glamping yet, but with this blog, I just called my parents and set a glamp event for our reunion. We will definitely try this! Good thing there are more pet-friendly resorts nowadays. Now our little furry friends can join in on the fun!